of a precision strike on members of Pyongyang’s high command. “The cruise missile unveiled today is a precision-guided weapon that can identify and strike the office window of the North’s command headquarters,” ministry spokesman Kim Min-Seok told reporters. headquarters’ activities” during wartime, Kim said. South Korea’s military has been on a heightened state of alert ever since Pyongyang first threatened the nuclear test which was eventually conducted on Tuesday. It was the North’s third test, following previous detonations in 2006 and 2009, and seismic data suggested it was significantly more powerful. The test appears to have galvanized South Korea into flexing its military muscle and highlighting its own technological prowess. 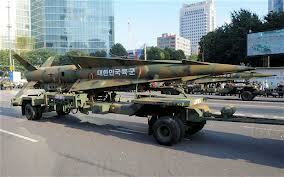 target in the North anywhere, at any time of our choosing,” army Major General Ryu Young-Jeo said of the cruise missile. On Wednesday, South Korea said it would accelerate the development of longer-range ballistic missiles that could also cover the whole of North Korea. In October last year, South Korea reached a deal with the United States to almost triple the range of its ballistic missile systems — with Seoul arguing it needed an upgrade to counter the North’s own missile development. The United States has 28,500 troops in South Korea and guarantees a nuclear “umbrella” in case of any atomic attack. In return, Seoul accepts limits on its ballistic missile capabilities. The defence ministry also said it would speed up the deployment of a “kill chain” system capable of detecting, targeting and destroying North Korean missiles.